Customer satisfaction normally gets measured by the smallest things. We've had customers select us because we sounded nice on the phone. We've had others select us because we simply contacted them after their housecleaning was completed. And we've lost customers before because we returned a phone call too late. It's the little things that count. Here's proof that little things can make a big difference. Ok, we're a little proud of ourselves. We've just recorded our first radio advertisement. Take a listen. I detailed my idea for reducing America's growing reliance on immigrants recently. Your product or service is a commodity if you don't provide anything but a product or service. Provide something extra and you get the opportunity to charge more because the product or service is now worth more. Charge more for your product or service and you get the opportunity to pay your employees more. Pay your employees more and you get the opportunity to select Americans for your employment pool. Make price your only benefit and you're forced to hire cheap labor. Americans can't live off minimum wage, but our new citizens can. They're used to a much lower quality of life. They'll stick it out and work for minimum wage. Providing a cheap product or service means that you're hurting the overall health of our nation. Read this if you don't believe me. The only way that a customer can be satisfied is if your employees are also satisfied. Low morale in any type of organization leads to major problems. In the early days, we had terrible employee morale. Our pay was low, our work was hard, and our demands were stringent. We expected a lot out of our employees, but we didn't reward them with anything but a tiny paycheck. At the time, it seemed as if that were the only way to make our business work. Of course, times have changed and we now have a group of employees that collectively enjoy working for us. It's difficult to have unanimous support in a workplace. But, it's not difficult to have unanimous disgust. Make one employee unhappy by treating them unfairly and you'll quickly find out that a large percentage of your workforce knows about it. Do nothing about it and your ship will start sinking. Employees shouldn't feel as if there are two sides to a business. I know it sounds cheesy, but management needs to treat its employees as teammates. Anything less and you have a problem. This month reminds me of the holidays. Lots of work to get prepared for the big day. Lots of anticipation for the big day. It's Christmas all over again. The grand opening of our new office in Panama City is just a few short weeks away. We've been training, planning, and planning some more for the last couple of months. In about 27 days, it's time to start working. Panama City doesn't know it yet, but things are about to change. We're about to raise the wages for all housekeeping employees in the city. We're about to raise the level of customer service for all service related companies in the city. We're about to take over the housecleaning market. And it's all because of three words. The best three words an employee can hear. The best three words a customer can hear. For the most part, customer service is dead. It's a lost art for today's modern business. It's much easier to blame declining sales on bad marketing. It's also much easier to blame declining sales on your high prices. Don't fret, your sales are telling you something. You need to start providing more than just a product or service. You need to start providing an experience for your customer. 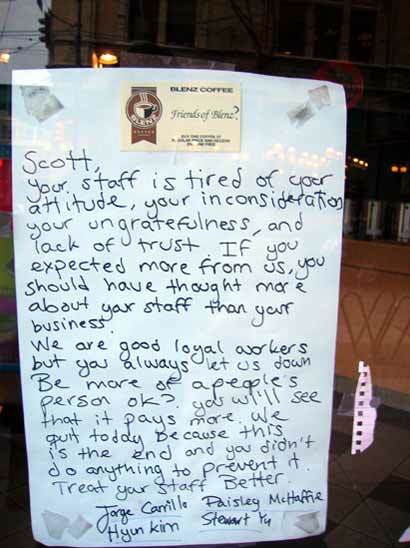 Take a look at how this restaurant makes customer service a strength rather than a weakness. Notice how the author points out that the restaurant's prices are the least important advantage that it has over its nearest competitor. Exceptional customer service isn't born overnight. You can ask our customers from the early days and they'll confirm that it takes time for a customer service oriented culture to evolve. Yeah, it's easier to just price your stuff lower. And, it's easier to just change your advertising strategy. But, who told you that it should be easy?